This blog post has been turned into a more usable format over on my Checklist page. Give your business a healthcheck and make sure you know what aspects of IT you need to have thought of. Or contact me and I’ll help you through it. You’re just starting out, you have your business plan and you’re trying to make sure you have everything in place to make your business successful. Or, maybe you’re already all set up and you’ve been running your business for a few years but you know that you’ve been winging the technology side of things because it’s never been your thing. Or maybe you’ve even had some kind of technical failure or data loss and you want to make sure your tech stuff doesn’t let you down again. Whatever your situation, the last thing any business needs is to be held back by something as mundane, yet essential, as technology. I want to help make sure you have thought through everything you need to make your business fly, not limp. As a small business leader, the more time you have to focus on your business, the better. Getting each of these systems set up properly – whichever ones are relevant to you – should save you time and stress, especially if you have someone who can help you get it done. Know any good IT people? I’m not affiliated with any of these recommendations currently. If I add any affiliate links later I’ll make that clear in the text. If the answer is ‘on my laptop’ or even ‘on a portable hard drive’ then you need to consider ways to keep that data safe. You should never have data in just one place, especially not if that place is a single portable computer or disk. By data, I mean documents, financial records, invoices, whatever files your business depends on. Every disk will fail eventually, and it’s always best to assume this will happen at a bad time. Your data needs to live in at least 2 places, and ideally in 3. I would advise you to have at least a local backup (like Apple’s Time Machine or other equivalent, on a hard drive you keep plugged in to a computer) and a cloud backup (to cover you if someone or something steals or destroys the computer and backup drive together). The other thing about where your data lives is this – if your business grows, or you take on a virtual assistant, how will anyone else help you work if your laptop is where all your files are? Traditionally this would have meant setting up some kind of server, but now I’d always suggest a cloud collaboration suite like Office 365 or G Suite. At the very least you will want something like Dropbox for your files, even if you don’t want the other features of a full suite. The free version will get you going if you don’t have a lot of stuff. You have an obligation to keep your customer data secure. Cloud services have people whose job it is to work out how to do that. Your Excel spreadsheet on your laptop with names and addresses of your customers is not particularly secure. Worth thinking about, at least. I’m not a data protection expert but I know that you don’t want to be the one who leaks customers’ personal details to the world. How are you communicating with and relating to customers? No electronic system will magically solve your needs if you don’t understand your business processes. But when you know the flow of information within your business, you can plan out the various forms your data needs to take and what systems you could use to store and manage each stage. Do you have a separate business email? Or are you trying to do everything from your personal Gmail or Outlook.com account? There’s a couple of issues to consider here. First, how professional you seem, and second, how easily you can work. If you’re using a ‘home’ email system, your email address will be something like davetheplumber@gmail.com – or if this is literally your personal account, dave_spurs_4_eva@outlook.com. The thing is, if you’ve got a professional website at bespokeplumbingservices.com, you’re aiming to show people that you’re a slick, real business that can be trusted. Your crazy email address can let you down here. The absolute minimum is to set up a forwarder from an email address on your website’s domain – info@bespokeplumbingservices.com – that goes to your other email. That will at least let you put something professional on your business cards and ads, although when you reply, you’ll still be sending from your normal address, so that’s why the other minimum is to have an email address that at least mentions your business. Also, you’re shooting yourself in the foot if you have everything coming into the same account. When you sit down to do a day’s work, your attention will be pulled away from important things to… whatever else you get in your inbox. Newsletters, offers, Facebook notifications, friends, and so on. You’ll spend as much time trying to get back into work mode as you do actually answering work email – and just as bad, you’ll end up answering work email in bed when you check your personal mail. Finally, even if you set up that forwarder, clients will get mail from dave_spurs_4_eva@outlook.com and think… who is this guy? At the very minimum (and I’d always recommend going further than this), you should have a separate Gmail or Outlook.com email with your business name in it, and avoid checking personal mail while you work. Would a live chat window on your website help you get business? Something like Crisp or Purechat have web plugins that will let web visitors chat with you to ask questions about your services. If you need to communicate with many people at once, how are you doing this? Do you clunkily mail merge from an Excel spreadsheet into Outlook? Or could you use an online service like Mailchimp or Constant Contact? Anything you can do to reduce the manual steps you have to take to get something looking good and self-managing will save you time – and as a sole trader or small business leader, your time is the most crucial thing you have. Plus, these will help with your data protection compliance. How do you keep track of your customers and potential clients – how you’re doing with developing them, what you last said to them, and any sales pipeline you might be taking them through? You might need a CRM system, which used to be expensive, but there’s now a few free ones out there that suit small businesses. HubSpot is one of them – free, but with a lot of features if you want to set up a full sales pipeline and lead management. How are you keeping your financial records and managing your invoices? If you’re still doing this manually, you will really save a ton of time by trying a cloud-based system like AND.Co (which is free) or Freshbooks, which will track your expenses, quotes, invoices and payments, as well as sending reminders to late payers so you don’t have to spend time on that. For photographers, I’d definitely recommend Light Blue, which can manage your whole photography business – financials, bookings, appointments, the works. Some of you may make a product that reaches enough customers that you want to have a place to get product feedback or even provide a helpdesk service for your product. Cloud services like UserVoice or Zendesk can be helpful for this. I’ve learned from my experience running an IT department that splitting feature requests or user help tickets away from your normal email lets you make sure that you keep comunication going until it’s resolved, rather than losing customers’ requests in the sea of your email. This can mean the difference between a pleasant support experience and making a customer angry because you’ve forgotten about them. If you don’t have a credit card machine, and think you might want one, luckily that market is becoming a lot easier and cheaper. Devices like iZettle pair with your mobile to allow card payments on the go. Not taking cards can be the difference between an immediate sale and a ‘well, I’ll think about it’ in many lines of work. They take a small percentage fee for each transaction of course, but it is worth weighing up what extra sales you may make by having this available. Do you provide any IT for your clients? For example, does your hotel provide wifi to guests, or have a computer in the lobby for people to use? Do you have iPads for visitors to your shop to find out about your offerings? If so, you’re going to have to consider how to manage security and maybe even device tracking. You may need a bespoke service to help you charge or automatically assign WiFi use, if that’s not just going to be a guest WiFi password on a sign. And if you are just a B&B it would be worth finding out if your WiFi router has a guest WiFi mode. Orange in France now supplies routers with this feature, which will keep guests from being on the same network as your own computers which hold your business data. If you hold stock, an inventory management system could come in handy. Spreadsheets will eventually get too unwieldy to manage. There are some decent free programs and cloud services out there that can help you track what you have and where you have it. If you have a few people working for you, how do you coordinate projects or other shared work? You could consider a project management platform like Asana, Trello or Basecamp. You might need a simpler task management service like Wunderlist. Or, if you’re going in the direction of a full collaboration platform anyway, features of Office 365 can be used for this too. When people hear ‘team chat’ as a concept, they usually first assume that this is about wasting time or can’t see why you’d ever want to do that when you have email. I can tell you that team collaboration apps like Slack, Microsoft Teams, and Hangout Chat in G Suite can really change how your team functions, cut through the email overload, allow people to get quick answers to things they’re working on, and make it easier to keep all the discussion on a particular topic in one place. Best of all, whether you use one of the productivity suites (Office 365 or G Suite) or not, there’s always a free option to try. The best ones integrate with all the other stuff you’re using, and let you voice and video chat with your teams as well as using text chat. Even just between 2 people, this can change how you work for the better. It’s hard to see how in a short paragraph like this but in my experience, email as an internal communication method is a disaster both for all-company news and for team collaboration. As it takes a little bit of getting used to, you might get more out of it with some professional help, or at least plan to spend some time working with it before you start to see the benefits. The problem is that we don’t think of our own time as an hourly rate. You should really work out what your own hourly or day rate is, and then you will be able to see whether paying for a service will be worth it. The CEO or business leader has a unique role in a business. There are a lot of things only you can do. If you spend too much time doing things anyone can do, you’ll have no time for the critical decisions and strategy you need to move your business forward. Delegate as much as you can. Keep less in your head and more written down in systems or procedures someone else can follow for you. And hire contractors you trust to have your business in mind, not just their own. I personally work as if I was your own personal IT department – just smaller. You can’t probably hire a full-time IT person, but you can contract one in on a regular support agreement, working on whatever you’d task an IT staff member to do, from user support to configuring your cloud services. I’ve had clients from a couple of hours a month all the way to 3 days a week, and I also work on a project basis to get new systems set up and make sure you know how you want to use them. I hope this has helped you get an idea of some of the IT questions small businesses need to answer. 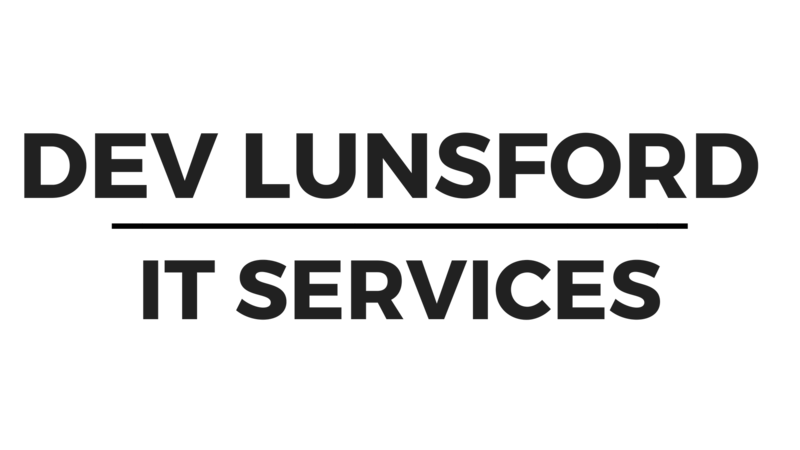 I plan to post more details on most of this stuff so that you can get a head start on getting yourself going, but if anything here has made you realise that you might need some hands-on help, drop me a line on info@devlunsford.com and I’ll see if I can get you going.